Recent advances in cellular science are heralding an important evolutionary turning point. For almost fifty years we have held the illusion that our health and fate were pre-programmed in our genes, a concept referred to as genetic determinacy. Though mass consciousness is currently imbued with the belief that the character of one's life is genetically predetermined, a radically new understanding is unfolding at the leading edge of science. Cellular biologists now recognize that the environment, the external universe and our internal physiology, and more importantly, our perception of the environment, directly controls the activity of our genes. This video will broadly review the molecular mechanisms by which environmental awareness interfaces genetic regulation and guides organismal evolution. This book 'The New Biology' will forever change how you think about your own thinking. Stunning new scientific discoveries about the biochemical effects of the brain’s functioning show that all the cells of your body are affected by your thoughts. The author, a renowned cell biologist, describes the precise molecular pathways through which this occurs. Using simple language, illustrations, humor and everyday examples, he demonstrates how the new science of Epigenetics is revolutionizing our understanding of the link between mind and matter, and the profound effects it has on our personal lives and the collective life of our species.. The Biology of Belief is a groundbreaking work in the field of New Biology. 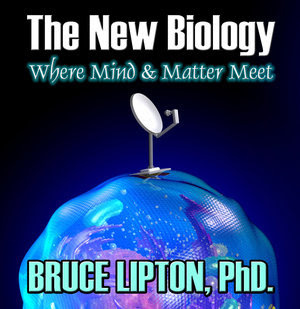 Author Dr. Bruce Lipton is a former medical school professor (University of Wisconsin) and research scientist (Stanford University School of Medicine). His experiments, and that of other leading-edge scientists, have examined in great detail the processes by which cells receive information. The implications of this research radically change our understanding of life. It shows that genes/DNA do not control our biology; that instead, DNA is controlled by signals from outside the cell, including the energetic messages emanating from our positive and negative thoughts. Dr. Lipton’s profoundly hopeful synthesis of the latest and best research in cell biology and quantum physics is being hailed as a major breakthrough showing that our bodies can be changed as we retrain our thinking. - Joseph Chilton Pearce, Ph.D. Author of Magical Child; The Crack in the Cosmic Egg: New Constructs of Mind and Reality; Evolution’s End: Claiming the Potential of Our Intelligence among others.